I thought I would share a preview of all of the projects that I have been designing, sewing, stitching, writing, illustrating, and shooting video of over the past several weeks. This place has been hustle after bustle and now settling into a calm flow where I can reflect on all the work that's been done and look forward to sharing it with you. All of the above photos are a glimpse at the next round of classes that I will have launching with my friends at CreativeBug. The the end of this month will see them offering lots of new, beautiful quilting and patchwork classes and I am so happy that I will be a part of that. *The first quilt is called the Flying Gosling Baby Quilt- (get it, gosling, bc it's a baby quilt). It's fun to say Flying Gosling fast 'cause it sounds like Ryan Gosling, though really they don't have anything to do with one another, and it feels really weird that I just typed that guy's name in this sacred space of mine. No matter. The fun parts of that little quilt are evident in the photo. 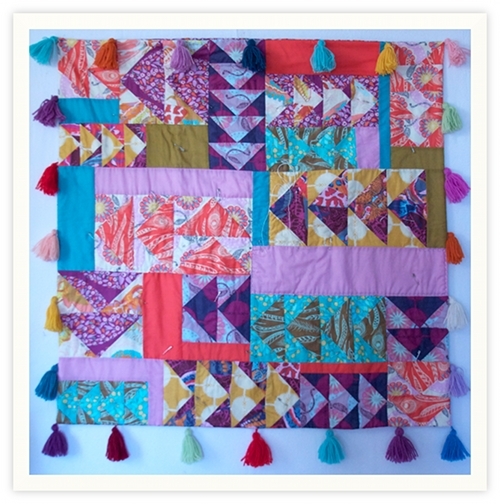 *The next is a whole cloth crib quilt where I get a chance to teach my method of hand quilting. You likely know by now that I so enjoy that sorta thing and I do think it's such a good process to watch a person do if you've never tried it. *The 3rd photo is the Melting Snowball Tote, which I lurve a whole, whole lot, and I am about to get up from my chair and dump all my purse hoopla into this one and officially make it a part of my life. You might be able to see that the majority of this version was made with wools, which would not be imperative, but I do enjoy experimenting with textures. Maybe you do too. Who knows. 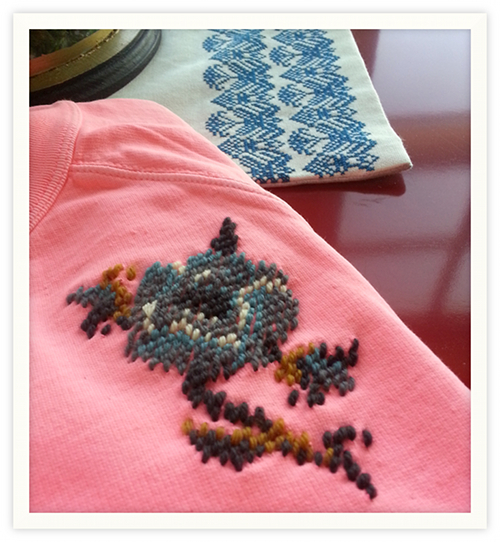 *Finally this sweet Needlepoint Rose project that you can stitch onto any existing garment, bag, linen, quilt block, etc. So nice and simple and just an enjoyable modern take on the craft. Oh! I also wanted to mention a new (and cool) feature on CreativeBug. The are now offering "a la carte" classes for individual purchase. So if you'd prefer to bypass the monthly subscription business and just take one class, for about the price of one pattern (or less) you can do just that with several of the classes. I have a couple as a la carte here. Also they are building up their free features section all the time, so there is now the option to sign up for a free membership to have access to those. The lovely thing about this group of people is that they are listening to feedback and responding, so pipe up if you care too. And next are the two new free projects I have designed for Janome. The above is the Right Turn Bag, which is all strip-piece-y and fun and comes in two size options. The pattern and video for this number will be launching at the end of this month. And these are the Pleasant Pathways Shorts which I was chatting about over here. I made both projects on the Horizon Memory Craft 12000 which is their tippity top of the line machine, and it seriously encourages me to try out some things that I've never really thought of doing. Which when you sew very often is a lovely bonus. The pattern for the shorts is for adult women, though obviously some of the smaller sizes will fit some of my middle-aged girls too. Regardless of your machine, the pattern for the shorts is a simple shape, with straight forward construction, and just as cute whether you embroider the fabric or use a favorite print. So win and win and win. This pattern will launch towards the end of March. So much to look forward to. I love my job. For the next few weeks I will be busy working on some new quilt tops to teach from during my workshops at QuiltCon. I am so excited for the event and for the excuse to now get sewing on some very unscripted projects. Ooooo...I love the Gosling! Beautiful! All wonderful projects. i can't wait to see/read more! that bag! those shorts! i'm (im)patiently waiting. 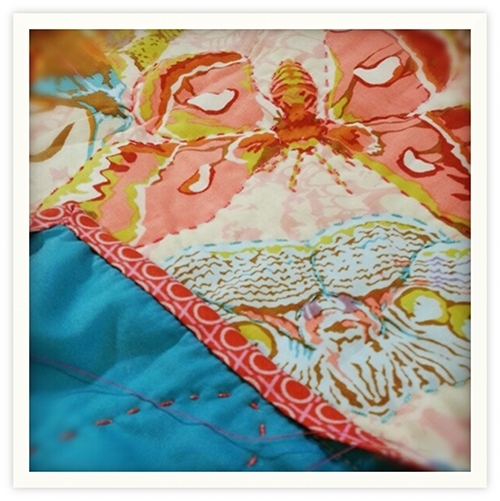 and super excited about quilting/patchwork on creativebug. yay! 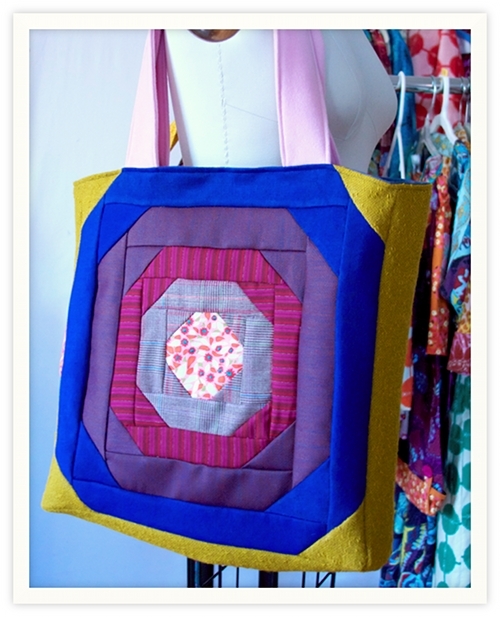 I'm super-excited about the hand-quilting class! 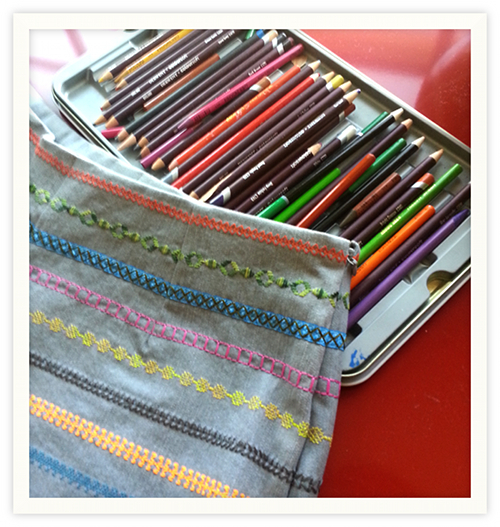 Oh, I am loving that bag you've designed for Janome! I've been wanting to make a new one but haven't seen anything I really like ~ I really like this bag ~ can't wait till the end of the month! I'm laughing at your comment about "middle-aged" girls. You meant tweens or early teens right? Loving all your projects and feeling a bit stressed because I need to get my things together for QuiltCon. I'm in your designing class and have no idea what to pull together. Do you have any helpful hints beyond what it says in supply list? I am assuming you are taking the Composing a Quilt Class? If so, it really depends on how far along you would like to be with a new quilt top when you leave the class. But as the description says, we are going to be using foundation quilting as a core method (though not imperative), which means that we will build onto a generally single whole piece. So perhaps you might want at least some of your fabric to be in large pieces that you could build other components onto. Of course your foundation could also be patchworked, which you could work on ahead of time or begin in class. And naturally you can start small, by just bringing favorite fabrics, and patterns for various blocks and make a smaller quilt top. I will have some extra supplies for your use and materials for purchase in the room to supplement whatever you bring, so I promise you will stay busy and have fun no matter what you show up with! LOVE the tasseled geese so much! I so love the right turn bag. I can't wait for the pattern! Oh I'm so glad the ryan gosling ;) is a class, I can't wait to take it. I saw the quilt tucked away a bit in your quilt market booth and asked to be able to take it out and feel it and see it as it completely captivated me!! Where is the Right Turn Bag pattern? I've been here and at Janome and didn't find it. Please tell me I did not miss it. 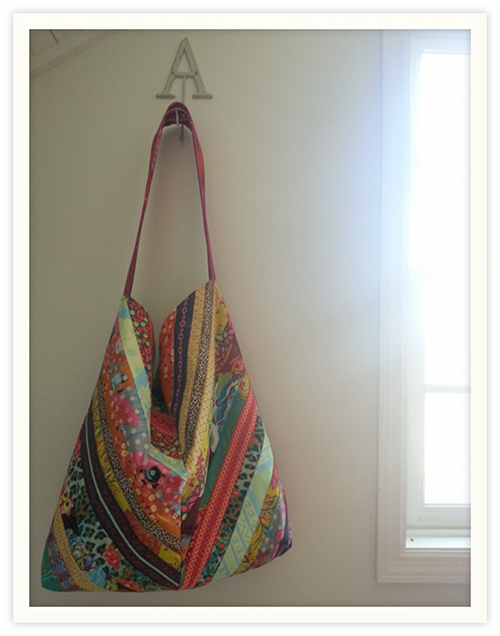 I am still anxiously awaiting the pattern for the Turn Around Bag. I love it so much!! I can't seem to find the Right Turn Bag pattern. Have you released it yet? Thanks! Where can we find the right turn bag pattern? I really want to make this for Mother's Day using grandma's fabric for Mom. Thank you! I'm also looking for the pattern for the right turn bag...? It's perfect for my fabric! Did the pattern ever come out for the Right Turn Bag?